We’ve both got a bit of a sweet tooth and these German biscuits are certainly high on our list of sweet treats that we love to bake over and over again. An easy to follow recipe, these German biscuits will make a great treat for you to enjoy with your daily cuppa, or the perfect biscuit to take out when friends or family call round. It’s also a great recipe to try and cook with the kids. Although they are traditionally round, at Christmas, Easter and Valentines, we like to use different shaped cookie cutters to fit the time of year. We hope you enjoy making these and can guarantee you, you won’t be disappointed with the taste!! Pre-heat your oven to 180C. In a fairly large bowl cream together the margarine and sugar using an electric mixer or wooden spoon. Stir in the sieved flour and mix well until this becomes a stiff dough. You may need to use your hands towards the end to help bind the mix together. Gently roll out the stiff dough onto a floured board to a thickness of about 5mm – 8mm, depending on how chunky you want your biscuit. Bear in mind that your final biscuit will be made of 2 layers of this dough. 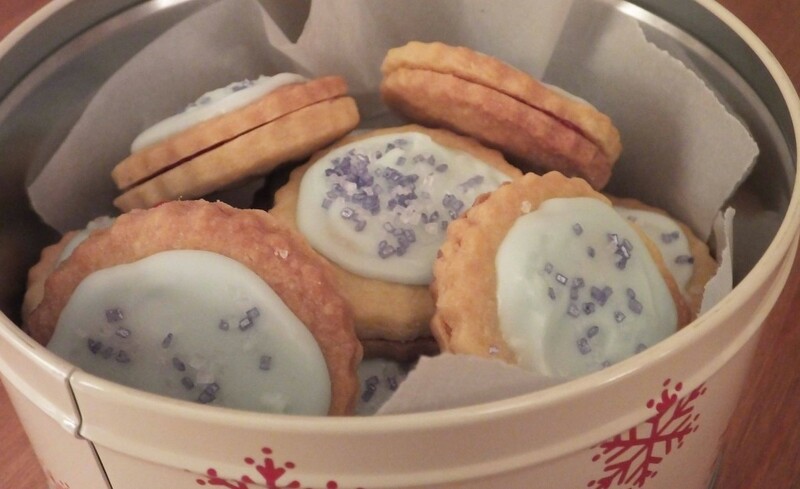 Using a cookie cutter, cut the dough and transfer the shapes onto a lined baking tray. Bring together the scraps of dough that are left, roll out and cut until all the dough is used. Please note: When rolling the dough it may be crumbly at first, but as you work with it, it will become softer and roll out easily. Transfer your baking trays to the pre-heated oven and bake for between 10 – 15 minutes. It is important to make sure the biscuits do not brown, but they become lightly golden. Once the biscuits are baked, remove the trays from the oven and allow the biscuits to cool on the trays. Top tip: Rotate your baking tray half way through the cooking process to ensure an even bake. Pour your icing sugar into a bowl. To this you gradually add 2 tablespoons of water, until you get the correct consistency. 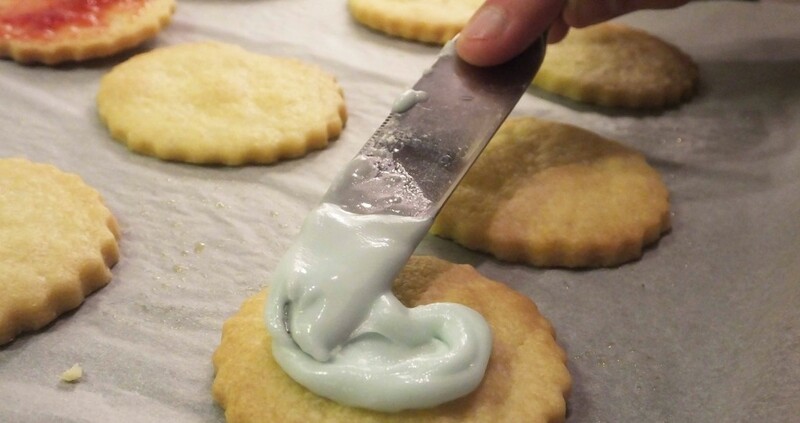 The icing should be spreadable but not runny. You can add food colouring to this if you want a coloured icing but remember, a little bit goes a long way!! Once the biscuits are cooled turn half of them face down, and cover with your desired flavour of jam (we think strawberry or raspberry works best). Be sure to stir the jam before spreading it as it makes it easier to spread. 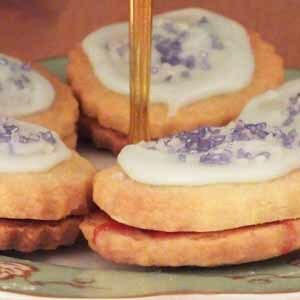 You will only need a little bit of jam on each biscuit and try to avoid having too many ‘bits’ in the mix. Ice the other half of the biscuits, which will still be sitting top side up. You can decorate the unset icing with sugar balls, hundreds and thousands or a sweet of your choice – i.e. jelly tots and midget gems. 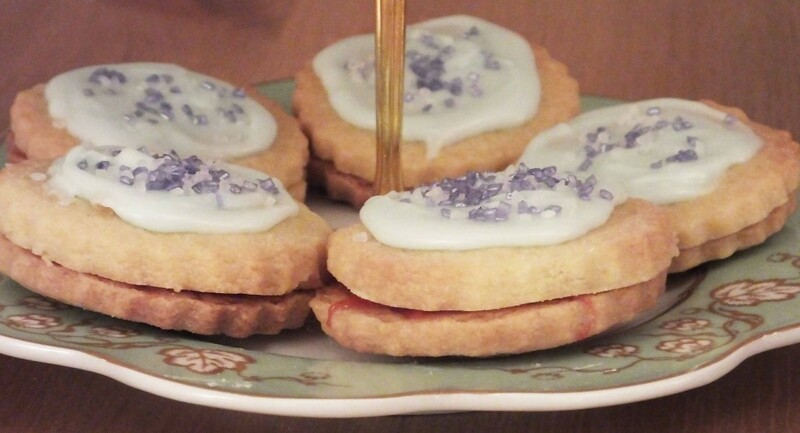 Once decorated, set your iced biscuit on top of the jammed biscuit and allow the icing to set. Once it has set, enjoy!! Check out our short video below on how to make and assemble these German biscuits. If you’re ever stuck for a gift idea for someone dear, make a batch of these and present them in a beautiful box or tin, lined with parchment paper.